What young boy or girl doesn't dream about what it would be like to live in space? Well with Pamela Freeman's The Fastest Ship In Space, imagination is only a turn of a page away, and what an adventure it is! The Fastest Ship in Space is a space adventure for young readers which follows brother and sister duo - Katie and Sam -- who live on a space station. A chance encounter with a meteorite sees part of their ship damaged which requires a docking at Space Station for repairs. The pair's gran, who also lives with them aboard the space ship, thinks the accident was too close for comfort and wants to return to live with her daughter on Earth: the family drama begins when she also suggests Katie and Sam may be safer with her. Gran decides to make a break for earth unbeknown to Katie and Sam's parents while at home station. Unfortunately for them, they find themselves aboard a ship destined for earth with smugglers, thanks to Gran's connections. Will they make it safely to earth, and will they want to return to space again? Young readers will have fun figuring out the answers to these questions. 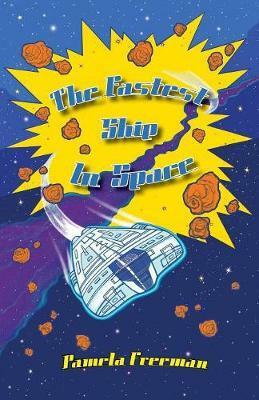 The Fastest Ship in Space is a fun and adventure-filled story, with space pirates, smugglers and spaceships.